IF I LAUGH is the working title of my novel. The premise: A young single mom and failed hippie returns from a midwifery-farm collective in the 1970’s to her suburban family home and forms the first all-ladies comedy club in her parents’ garage. Designing Principle: Force a suburb-hating idealistic young earth mama in the 1970’s to confront the lack of equality inside her cherished community on a farm collective. I’m finished with the outline and starting the first chapter and one of the other chapters. I’m enjoying the process of writing more than I usually do, because I’m letting my creative urge lead the way. I love writing three different stories in three different forms (screenplay, novel, graphic story) that spring from the same story world and character web. How is your creative flow going? Premise: Two junior high girls in the seventies think the messiah for the New Age of Aquarius is a stand-up comic. Designing Principle: Force a cultural critic (1970’s new rock star style comedian) to live and work inside the institutions he criticizes. Hey y’all, I’m opening up the old Life & Writing Blog, so that I can continue posting about such things. I have changed the title to my name, so it will be the same across multiple platforms. I’ll be going back over old posts and cleaning up broken links, but for now, some links in older posts may not be functional. I’ll be writing a daily post about creative process here, on Medium and on my facebook page. Thanks for reading and commenting! This is my creative process blog. You may check in here in the comments. Report what you’re working on and how it’s going. Ask or answer questions. Post an excerpt or synopsis. Or just read along while you do your work. A while back I started a process blog for drawing, but I wasn’t able to keep it up at the time. Now, I believe I can start today, June 1st, and work on my writing and other creative endeavors at least a little bit every day from now on. For me, that’s huge. I intend to make the most of this opportunity by keeping a daily creative appointment with myself. I always did better making it down to the Town Lake trail to walk when I scheduled it with one of my neat lady bodyworker walking buddies, Cameron, Liz, Kim, or Cheryl. So, I’m inviting others along here, too. Maybe start your own process blog on Medium or Facebook or other platform and let’s follow each other and link to each other. “Aha” moments about personal creative process and how to proceed. An excerpt from the work of the day. A mini-report on the work of the day. A question to readers about your own creative process. A question to myself about a creative problem. But I’m open to seeing where the blog wants to go. Please play along in any way you like. Hi everyone! I want to announce here on my blog that my feature-length screenplay, MY MARINA (formerly entitled DEPARTURE POINT, TEXAS), made the quarterfinals in the Scriptapalooza Screenwriting Competition. Ah! Feels good! Here’s some info about the contest. Thanks to my writers group and my sisters, especially Kim Atkins, for ongoing, invaluable critique. Monday a house exploded in my neighborhood, on my street, catty-corner and one over from me. For a news story on the event, click here. My post is a personal account of a few of my neighbors who were involved, shocked, and saddened. It was 8:23 AM according to neighbor Buster, who was working at home and looked up at the clock right when it happened. Neighbor Dale, driving home after taking his daughter to school, was directly in front of the house when it blew. The force moved his car. The roof of the house went up one story high and landed in the front yard. Debris began to fall over a larger area, and electric lines began sparking and exploding. He knew no one inside would have survived a blast like that and turned his attention to the house next door, moved off its foundation, windows blown out. Once inside he saw sheetrock blown off the walls, debris and possessions everywhere including boards and nails. The resident who had been blown out of bed by the force of the explosion wanted to stay and look for his dog, but Dale kept him moving out. The dog has since been found. Neighbor Jack, next door to the blast on the other side, was just about to take cute Harley the pit bull on a run (Jack on bike) when the house exploded. Jack, too, first went toward the blast, and found immediately there was no way he could go in. He could hear continued explosions, and see flames already engulfing the house. He, too, turned his attention to others, nearby, his wife and granddaughter. He ran back inside his own house and yelled, “Get out of the house. Now!” I spoke with him again earlier today. He said that after taking his granddaughter to another neighbor’s place, “Apparently I told Candy to get in the car with the dogs and just drive. I don’t remember that,” he said. My new neighbor next door, I heard from Dale, must have run out of his house exactly as the blast sounded, because he was barefoot and wore only shorts and t-shirt. It was cold and rainy. He ran behind the house to see if he could get in, and there met yet another neighbor, a teenager, trying to see if he could help. The entire back of the house had blown off, so they could see where the rooms used to be. Many neighbors ran from one street over in their pajamas to watch the tragedy unfold. When I talked to Jack minutes after the blast, his mind was squarely on his next-door neighbor, Renald. He lamented the fact that Renald’s car was in the driveway. He lamented the fact that the blast occurred during the time Renald sometimes would have already left for work. He gave thanks Renald’s son was likely not there with him. The boy lives in Houston, and though he was there sometimes visiting his father, Jack didn’t think he was there now. We now know he wasn’t. Jack asked more than once of neighbors standing around, “The car was in the driveway, right?” Right. He stopped talking. His nine-year-old granddaughter, Alicia, was watching closely. She asked, “Is he dead?” Jack said, “I don’t know, honey. Maybe so.” Alicia ran off to the neighbor’s house to be with her grandmother. View from my front yard. I keep thinking about these neighbors who dropped everything and ran toward a huge explosion, a rooftop flying up into the air and raining down, flames shooting out in seconds, engulfing a house in mere minutes. Then, they had the presence of mind to drop the first impulse to run into the fire, knowing the cause was lost, and turn immediately to the next most important concern, the people nearby who might still be in danger. I keep thinking about our lost neighbor. I didn’t know him, but had said hello passing his place while walking the dogs. He was almost finished with the remodel and looked forward to his son moving in with him, says a KVUE report this evening. Dale describes the blast (another neighbor Shirley speaks first, then Dale). Click here. (This is a report from Monday). As the facts of the story come to light and the investigation moves forward, I’m finding out other places in the neighborhood are leaking gas. Even last night I heard another story from a neighbor I met walking his dog. He’s experienced the strong smell of gas off and on for some time on his property. He expressed frustration with the gas company’s response and especially the ongoing nature of the problem. But now crews are on the scene day and night monitoring our street. Today I checked on the neighbor who mentioned those problems, and the gas at his place is turned off and the line is plugged. I’m glad. View from my front window. Despite this tragic event and the ongoing worries, I feel grateful to live here with these neighbors, and grateful for life. I’m moved by the heroism and calm of the neighbors who ran to help. I’m grateful for the firefighters, gas workers, and investigators. And I’m so sorry Renald won’t be able to live here among us anymore. 1/1/12. Happy New Year! Getting things organized. I’ve wondered which projects to pursue and how. I’ve had several meetings with Michelle from my writers group to kick around ideas for TV writing. Last Friday we met at the beautiful Twin Oaks Library and discussed it further. We’d been heading in that direction for a little while: we admire each other’s work; TV is collaborative; she and I bring varying talents and interests to the table which we felt would compliment each other during the process; and, we both have our own TV projects going. We discussed working together on both of those projects, and we made a list of current produced shows for which we’d like to try writing an episode together. Great discussion and interesting process. I learned I can’t brainstorm a way to kill a victim in the opening of an episode of CASTLE! Not one. Mind went blank. You pretty much need that skill if you’re going to write a murder mystery. Embarrassed! I’ve heard my own self say far too many times, “I have a hundred new ideas before breakfast.” Ha! Not that day. Well, we discovered we each want to continue our own projects separately, but what a shot in the arm to discuss the possibilities! The experience helped me rededicate writing time to my TV drama. We’re going to keep meeting to support each other in the creative process. You cannot believe the show she’s creating. I’m amazed, and you’re going to love it! After she registers her show with the WGA (Writers Guild of America), and if she says it’s okay, I’ll say more about it in this blog. Ellen Sandler Encourages Writers to Be God! (She writes comedy). The numbers below are mostly just a fun way for me to mention and describe my favorite teachers. I was inspired to try TV writing by Ellen Sandler of EVERYBODY LOVES RAYMOND fame, after reading her article, “The Writer as God,” on The Writers Store website. I grabbed my pen and started right then. She’s clear, humble, talented, funny, inspiring. And this article sealed the deal. She teaches classes in person about writing original TV drama at the Writers Store in Burbank, CA, but has not yet offered the class online. I’m keeping my eyes out for that. Her book, The TV Writer’s Workbook, helps you learn how to write for existing shows. In honor of the time of year, the day of the year, I resolve to write 1 to 2 hours per day on each of the above – a little less on the blog, a little more on the feature script. If I do, I will finish these projects this year and start making some money! 2012, the year of writing for pay! To welcome the new year, I’ve found it’s wise to say goodbye to the old, so I’d like to pay homage to the teachers who have created materials that help me learn and practice screenwriting. The zig-zag path of creativity is leading me into screenwriting as I put fiction and creative nonfiction in the file cabinets for now. The following concepts are seared in my brain and integrated into my creative process. If you’re on the screenwriting path, I hope this list of numbers (concepts, inspiration, and links to resources) helps you as much as they continue to help me. Nine ?? (If anyone can think of one here, please let me know). The Logline (or 1-line or Oneline) – The one line that encapsulates your story. You must have one later on to sell your script, and you better have one early on, so you know where you’re headed as you write. Look for this and more in Crafty Screenwriting: Writing Movies That Get Made by Alex Epstein – Fun. Easy read. Great tips on everything from creating to business. You can put these ideas into practice immediately. Epstein has a great blog, too: Complications Ensue. And he has a great book on TV writing called, you guessed it, Crafty TV Writing: Thinking Inside the Box. 2 Halves – Makes me remember to make the midpoint of my script a false high for the main character if the story is a traditional comedy, as in, it ends happily, and to make it the actual high point if the story ends in tragedy. 3 Act Structure – This one’s about rhythm. It’s a reminder that the whole story has a beginning, a middle, and an end. Every sequence has scenes of preparation, scenes of conflict, and scenes of resolution. Every scene has a set-up, an action, and a resolution. 4 Actual Acts – When you learn 8-Sequence Structure you find out that Act 2 is NOT one long rambling act of mish-mash that’s twice as long as each of the other two. Act 2 is really two separate acts that behave in an orderly fashion even as the story runs along in a surprising manner to the audience. 5 Moments – The ideas about your movie you can’t get out of your head. They’re the ideas that made you want to write the movie in the first place. They may be stunning visuals, lines of dialogue, the dramatic ending, the self-revelation. Keep close to your inspiration, even if you rewrite those scenes beyond recognition or cut them out completely. I can’t remember who said this. If you know, please let me know. It may be anyone referenced in this post, or quite possibly David Milch, creator of DEADWOOD, who not only quotes everyone who ever had anything to say about writing and language, but also says his own awesome quotes on life and writing pretty much all day long I bet. For proof, check out the DVD extras in DEADWOOD, and prepare to be blown away. 6 Things That Need Fixing – This is from Blake Snyder’s Save The Cat: The Last Book on Screenwriting You’ll Ever Need. He says in the first act, you have to introduce all the quirks and problems you’ll spend the rest of the movie working out. He has a fun and entertaining way of teaching 8-Sequence Structure. Worked great for me as a review, having already studied The 8 in a more intense way mentioned in #8 below. 7 Elements of Story. It’s always a good idea to brush up on the basics of story: 1. )Character; 2. )Plot; 3. )Setting; 4. )Theme 5. )Point of View; 6. )Symbol/Image; and 7.)Tone/Language/Style. I think Truby, mentioned below in #22, helps integrate all the elements organically while helping you develop your story. In fact, I’ve always felt most information on the 7 elements (some teachers point to only 4 or 5 main elements, but still discuss the 7 listed here) do a good job defining them and giving examples, but they do not do so well actually helping you integrate that knowledge into the practice of writing. Discover Truby. 8 Sequences – Every great movie is made up of 8 sequences of equal length, 12 and a half pages each (or 15 or 10 depending on the length of your script). Each sequence functions in certain ways no matter what movie. Learn these to help you outline your story or guide you in rewriting. From Screenwriting, The Sequence Approach: The Hidden Structure of Successful Screenplays by Paul Joseph Gulino. I’ll discuss the 8 sequences in future posts. 9 – I’ll add a 9 in a future post if y’all give me some ideas! Thanks. 10-Minute Sessions – Pilar Alessandra’s book, The Coffeebreak Screenwriter: Writing Your Script Ten Minutes at a Time, delivers on the title’s promise, getting you started no matter how you work or where you begin your process. Quick lessons followed immediately by exercises help you practice what you just learned. You may use the book piecemeal, or run straight through it. No writers block while you’re doing these exercises. I’ve got one of her classes on DVD and I took her 6-week email class on rewriting which was extremely helpful without being overwhelming. 21 Days…Writing a Movie in 21 Days by Vickie King – Easy read. Helps you see your movie in your mind’s eye, which is great if you haven’t done that yet. After all, movies are visual. Great introduction to sequencing. Vickie King claims you can write your movie in 21 days. While that may or my not be true (more likely not), you can visualize the entire story and outline it and get started in a big way if you need help with structure and visual thinking. While there are numerous arguments about whether or not learning structure helps or hurts a writer, as with anything, use what you need and leave the rest on the side of the road. I always feel it’s good to know the rules you’re breaking. 22 Steps…John Truby understands and clearly communicates what story actually is and how you do it. His book is THE word for me right now. 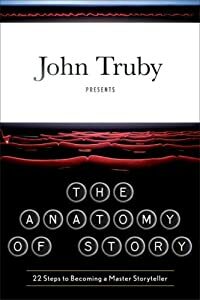 The Anatomy of Story: 22 Steps to Becoming a Master Storyteller by John Truby – Slow read. Complex. Helps you organize your story without imposing false structure on it. Truby leads you organically through the story you want to tell. Every sentence in the book reveals a secret you already knew at a feeling level. This book helps me organize all the countless notes I make when I first put my story ideas down on paper. It’s what you do anyway, but he tells you what it is you’re doing, where to start, what’s related to what, how to proceed. I can tell it’s going to save me tons of time. I tend to write down everything way too many times. Truby’s ideas and methods help me recognize what goes where almost immediately. Clear exercises at the end of series of related chapters take you along the 22 steps at your own pace. I do the steps as I read about them, but you can wait for the clearly-marked exercises. 40 Cards… At least 40 index cards as an outline on your floor, wall, bulletin board, or white board, will guide you well, especially if you include on each card the protagonist of the scene, the conflict, and the emotional change that occurs says Blake Snyder in Cat. 80 Scenes… Write 80 scenes and you have a feature screenplay. More or less. It’s simple, but it’s not easy. 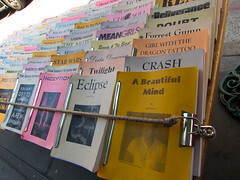 100 Pages… Shoot for 100 pages on your feature. The limit used to be 120, but nowadays it’s 100. What are your favorite books or best classes on screenwriting, writing, or story? What are your writing goals? Creative, business, process, anything? Do you know of any screenwriting or story instruction I can fill in for #9? Happy New Year! Happy Writing! “Tis the season for Christmas movies. I’ve already vegged out on two of my favorite B movies being played incessantly on Lifetime starting on Thanksgiving and running who knows how long, 12 MEN OF CHRISTMAS starring Kristin Chenoweth and COMFORT AND JOY starring Nancy McKeon. They’re fun. Maybe you like zombies. I like schmaltz. But this post is about the power and glory emanating from IT’S A WONDERFUL LIFE and A CHRISTMAS CAROL. I can’t wait to see them again. I’m throwing in THE GRAPES OF WRATH as another powerhouse emotional message movie along the lines of the other two. It lacks a Christmas setting but voices a similar message. Countless people across the decades love these movies. At one level, they’re simply great storytelling. They have good structure; a great villain; a compelling main character at the end of his rope who goes on a journey, endures dangers and complications, makes great personal sacrifice trying to get what he wants and realizes along the way he wants something else; the main character undergoes deep personal transformation that effects the lives of others in a positive way. After watching them we feel better. They reflect us at all our levels: body, mind, and spirit. They delineate our meanness, yet indicate we have the capacity for boundless compassion. They tell us which path we should take. They ask us to rise to our potential, which is spiritual in nature. I believe all three movies ask us to choose to be our better angels. Writers know any attempt to render such a story may get preachy fast. But they’re the the best stories when they’re done as artfully and beautifully as these. They want us to wake up already and actually serve family, humanity, and God and not just say it. They connect our everyday dealings with our spiritual selves. The writers of these three movies (and the writers of the stories they’re based on) wanted to affect deep change in humanity. Not just George Bailey or Tom Joad or Scrooge. All of us. We, too, are the hero who is down, who must sacrifice or make a choice. Either buckle under the pressure and escape, or take a stand for what’s right, which usually has something to do with realizing our connection to others, not just personal or family, but everyone. On the other hand we’re also Potter in LIFE, the camp bosses in GRAPES, and Scrooge in CAROL before his dark night of the soul. Who is Potter but today’s “1 percent” who own everything but care only for the bottom line? Corprations are people, but people, somehow are just stinky, lazy, whiny protesters. How dare they speak up! Instead of Potterville, we have Wall Street. And we have a bunch of Cratchits and Joads, George Bailey’s and Dust Bowl emigrants, who work or look for work, care for their families, AND go down to protest against economic injustice, peacefully, as is their right. I’ve been amazed at the Potter-y, Scrooge-y attitudes my fellow Americans spew on facebook on a daily basis, deriding the protesters as lazy people unwilling to work. And then use stories of their own struggles to somehow “proove” the validity of their prejudice. I don’t get it. Why make such a leap? Why assume a group protesting injustice is lazy? On the contrary, they work hard AND they stand up for what’s right. They do more. Risk more. And they get smeared for their trouble. And pepper-sprayed and beaten. No one sees himself or herself as Scrooge or Potter or the camp bosses that oppress the Joads. But we side with those forces when we deride our struggling fellow Americans. I invite everyone who regards the protesters thus, to watch any one of these three movies this season and ask yourself which forces you’re empowering? Why love the beleaguered main characters of movies and not your fellow citizens performing the same role? Throw Open the Window and See the Light! IT’S A WONDERFUL LIFE calls us to value ourselves, take a stand against inhumane circumstances, and put our money in small community banks that actually serve us as human beings. 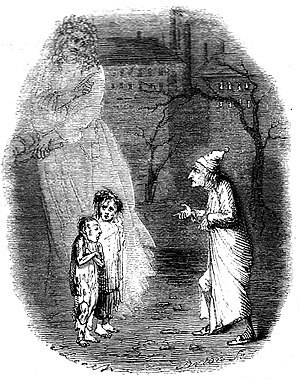 A CHRISTMAS CAROL asks us to examine our hearts, cast out the part that devalues real work, human emotion, and life itself. Today is the day to feel and express compassion for everyone, the sick, the injured, and those who work hard but are not valued or rewarded. I think all three movies ask us to look at the way we devalue and objectify human beings, with dollars, currency. There’s confusion between what is human and what is not. When people are separated from their own humanity, their feelings of compassion, friendship, and love, then hatred flows toward the very ones who suffer and dare to stand up, speak out, and make change. May we watch this season and not only be entertained by the images but moved and transformed by their messages. John Steinbeck and director, John Ford and screenwriter, Nunnally Johnson for THE GRAPES OF WRATH; director and screenwriter, Frank Capra and the long list of contributing screenwriters for IT’S A WONDERFUL LIFE; Charles Dickens and the many directors and writers of various versions of A CHRISTMAS CAROL, probably wanted us to enjoy the stories, but also be moved by them. Be better. Let them inspire love for our fellows. We are mean and selfish, or we are compassionate and aware of our connections to others. We hide behind holiday expressions, or we live their true meaning. I included this music video in the preceding post. 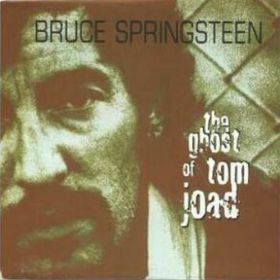 Here it is again, Bruce’s take on the Tom Joad “I’ll be there” speech for modern times. Like Tom Joad, Bruce is there for the souls who suffer. Let’s all be there.